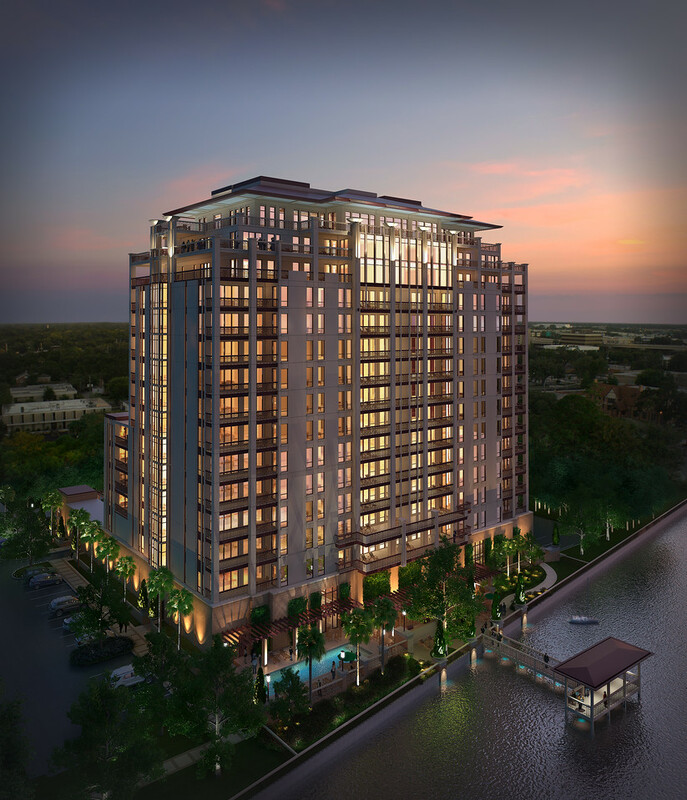 Hallmark Partners, a full-service commercial real estate company with a portfolio of more than $400 million in property developments, revealed the design for Beacon Riverside, a luxury condominium tower on the St. Johns River in historic Riverside. The planning, design and construction teams for the building are comprised of members that created the Villa Riva Condominiums and 220 Riverside residential projects in the Riverside neighborhood. The building embodies the rich traditions of Riverside architecture refined to reflect an updated design with modern features and amenities. Located at 500 Bishopgate Lane, the 16-story building will feature 56 exclusive for-sale residences ranging in price from $600,000 to $2 million. 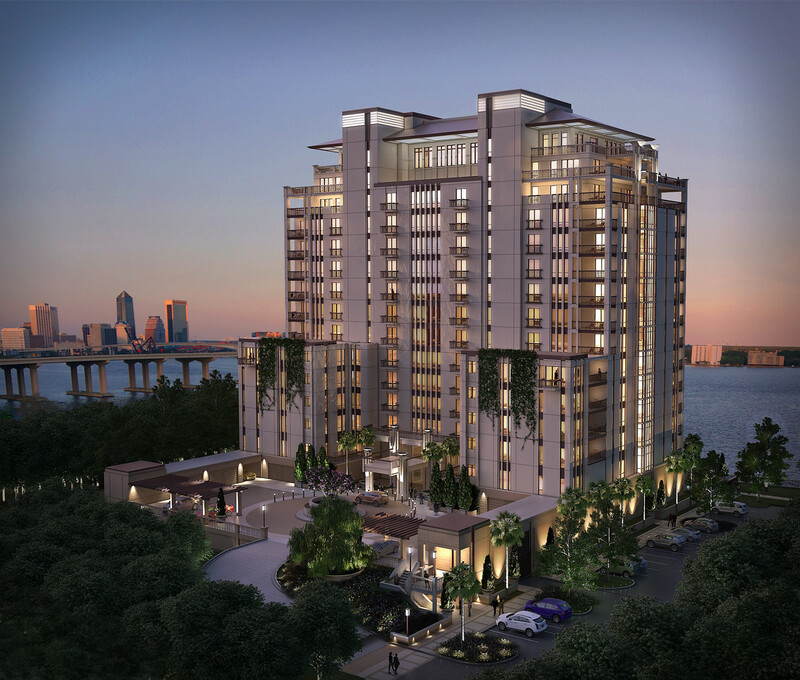 The 2,100 to 4,000-square-foot luxury residences will showcase ten-foot ceilings and spacious terraces offering expansive views of the St. Johns River, the downtown skyline as well as city views of historic Riverside. Private elevators will access upper floor penthouses that will be designed with individual owner input. Following The Great Fire of 1901, leading citizens of Jacksonville built an elegant corridor of homes along Riverside Avenue known as “The Row.” An influx of architects and skilled tradesmen gave Riverside the broadest variety of architecture in the region. After 1910, the Prairie School movement that rejected the historic revival trends and strove for a new authentic American style influenced many Riverside homes. The Prairie style, as well as Chicago-based high-rise architecture, was introduced to Jacksonville during this period. Building amenities focus on a luxurious and private lifestyle. Residents will enjoy a spacious clubroom and lounge, terrace and fitness center with spectacular water views adjacent to a glass-enclosed guest lobby and gallery. Concierge and on-site property management services are planned. In addition to the fitness center, a fitness studio is included for stretching and programmed classes such as yoga and pilates. A guest suite, an entry porte-cochere, secure under-building parking and available private garages provide additional features for owners. The building and residences are designed to take advantage of today’s expanding technologies. On the St. Johns River, a private pool and owner’s pavilion provide riverfront enjoyment. The Beacon Riverside Sales Gallery, opening mid-October, is located at 806 Riverside Avenue across from the front doors of The Cummer Museum of Art and Gardens. Construction of Beacon is scheduled to begin the first quarter of 2014 with completion slated for the 4th quarter of 2015. For more information, please visit beaconriverside.com or contact Kristilee Adler at ka@naihallmarkpartners.com and by phone at 904-363-9002.